Process optimisation by Real-Time Control! Major installation at English sewage treatment works. Wessex Water, an English water authority, is investing around £20m at its Taunton sewage treatment works to improve the facilities for wastewater and sludge treatment in a project that is due for completion by the end of March 2015. The upgrade to the works under the DWF (Dry Weather Flow) Improvements Scheme will increase the site’s treatment capacity whilst also improving the efficiency and quality of the treatment process, lowering energy costs and reducing the site’s carbon footprint. Prior to the implementation of the DWF Scheme, the STW was comprised of an inlet pumping station and balance tank, coarse and fine screens, grit removal (detritor), primary settlement tanks, a conventional ASP & biological filter beds, final & humus tanks and final effluent lagoons. The construction work involves the creation of a new four-lane ASP to replace the existing 16 biological filters. To facilitate this, one of the lagoons and four of the filters are being taken out of service to create space for the new works, and this has allowed all development to remain within the existing site boundaries enabling most works to be constructed under permitted development rights. Process optimisation of the new ASP stage will be achieved through implementation of Hach Lange’s Real-Time Control (RTC) system, which monitors influent ammonium concentration and dissolved oxygen concentrations along the aeration lanes, providing more efficient control of the fine bubble diffused aeration. The measurement of other quality parameters in the process train provides feedback to the RTC. A reduction of up to 15% energy usage is anticipated as a result. Real-Time Control in industrial processes is commonplace. However, wastewater monitoring represents a greater challenge because of its physical and chemical variability. 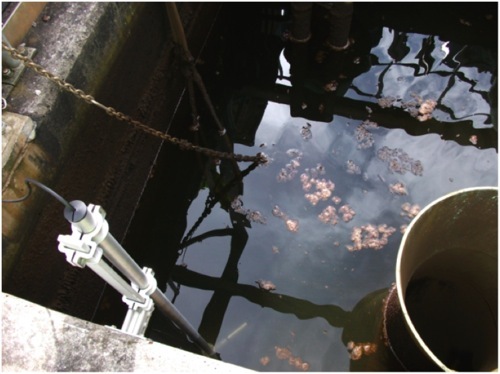 Historically, wastewater monitoring technology was prone to drift (especially galvanic dissolved oxygen monitors) and required a high level of maintenance, so RTC was not feasible. However, the latest sensors offer much higher levels of reliability than was possible in the past, with substantially lower levels of maintenance and recalibration. This has been a major factor in enabling the development of RTC in wastewater treatment. In addition, many of the latest sensors provide a ‘health status’ output in addition to the readings. As a result, if any problems arise they can be quickly remedied, and control systems can ignore data from sensors that are not performing to their target specification. The capital outlay for the addition of RTC to a treatment plant is relatively small; the most significant extra cost is the requirement for extra sensors plus the RTC unit. The Taunton build includes the installation of the latest sensors for dissolved oxygen, ammonium and turbidity, controlled by an sc1000 network, providing reliable data on the influent, and from within the treatment process. The LDO sc dissolved oxygen sensor employs an optical luminescence method for calibration-free and drift-free measurements. Once the construction work is complete there will be four new lanes, each with three zones, so a total of 12 LDO probes will monitor dissolved oxygen. In addition, two SOLITAX ts line dip probes will measure Mixed Liquor Suspended Solids (MLSS) content in the aeration lanes and the solids content of the Returned Activated Sludge. The RTC at Taunton will also control sludge retention time, which enhances plant efficiency. The suspended solids probes employ a patented dual scattered light method with a built-in wiper, to provide colour-independent measurement of solids without a requirement for calibration. Ammonium measurements will be undertaken at both the entrance and exit of the aeration lanes with two AMTAX sc instruments; high-precision analysers that continuously collect samples via an air-bubble cleaned filter probe. The ammonium analysers will be mounted directly over the filters to minimise the distance travelled by samples. The Hach Lange RTC is implemented on an industrial PC which communicates with an sc controller network and the local PLC. The RTC system determines the most efficient aeration level and continuously feeds DO set points to the PLC which controls the blowers. This means that under RTC, DO set points are no longer ‘fixed’, instead they ‘float’ according to the load. The RTC modules continuously deliver set points to the PLC, which applies them to the process. This ensures that response to changing conditions is immediate. The algorithms employed by the N-RTC (Nitrification Real Time Controller) are mainly based on the Activated Sludge Models of the International Water Association. The N-RTC also constantly reads the NH4-N concentration at the outlet of the aeration lane. This value provides a feedback control loop and ensures that the DO concentration is fine tuned to achieve the desired ammonium set point at the end of the ASP. In this way, the N-RTC control module combines the advantages of feed forward and feedback control, which are (1) rapid response, (2) set point accuracy and (3) robust compliance. Aeration to achieve the biological oxidation of ammoniacal compounds to nitrate is the most energy intensive process at activated sludge plants because blower power consumption can represent over 50% of total costs at some plants. However, in addition to the advantages of the process optimisation system, four new Sulzer high speed HST-20 turbo-compressors are being installed by Nomenca, following trials on similar units by Wessex Water. These machines employ a control system that manages both the number of blowers to run, and the speed of the blowers, which will further improve energy efficiency. Richard Reeves, Principal Process Scientist, Southern Water, and David Ballinger, Optimisation and R & D Manager, Southern Water discuss this application. Southern Water supplies water and wastewater services for Kent, Sussex, Hampshire and the Isle of Wight in the south of England. Southern Water operates 370 wastewater treatment plants (WWTP), many of which are unmanned for most of the time and most have numeric environmental permits, so a network of online monitors has been established to improve treatment and protect discharge compliance. This has involved the installation of final effluent monitors at over 300 sites in a programme that has lasted for more than ten years. The online monitors are comprised of a Hach Lange turbidity probe with sensors for temperature and level (to show when the turbidity probe is out of the water) and mounted on a plastic ‘spade’ which holds the sensors in position at the final effluent monitoring point. As a measure of clarity, turbidity provides extremely useful data; a cloudy final effluent suggests poor treatment and possible discharge permit failure. In 1993 Southern Water conducted an extensive research project to demonstrate that effluent clarity, as measured by turbidity, can be related on a site by site basis to permitted BOD (Biological Oxidation Demand) and TSS (Total Suspended Solids). The constituents of final effluent are such that biological slimes and algae are prone to develop on optical surfaces, and the trials therefore concentrated on the most efficient method of probe cleaning. Probes with no automatic cleaning were therefore eliminated. The technically preferred monitor was the Hach Lange Solitax turbidity probe, which incorporates a silicon rubber wiper, which sweeps over both optical surfaces at a programmable frequency. Southern Water also found that the cleaning efficiency was improved by the addition of an air purge which blows away the loosened solids. Hach Lange has confirmed that their SC200 and SC1000 controllers and the SOLITAX sc turbidity probe were awarded MCERTS certification on 1st November 2012. MCERTS is the Environment Agency’s monitoring certification scheme and currently only a small number of analytical instruments have achieved this award. However, an MCERTS certificate demonstrates that equipment has met or exceeded the stringent performance requirements of the scheme. The monitor control unit is mounted in a separate cabinet which also houses the air compressor. 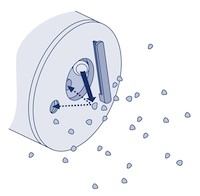 When the plc calls for a clean, the wiper operates followed by two air purges which release the algae/biofilm. A further wipe then removes any remaining material. Cleaning is initiated every hour and, when a clean is called for, the last recorded turbidity reading is held in the monitor for 5 minutes, to avoid recording the false turbidity generated by the loosened material. Linton Electrical Contractors (Kent) Limited has a longstanding relationship with Southern Water and was responsible for the final design and installation of the final effluent monitoring systems. Subject to prior approval by Southern Water, the installations incorporate the latest Hach Lange instrumentation as it becomes available. Linton Electrical is now installing as standard the 110V MKV SC200 controller and occasionally the MKVI SC1000. Each system is complete with conductivity sensor, level sensor, temperature probe and air cleaning system; all of which is mounted on a PVC spade. The WWTP telemetry outstation scans all connected monitors every second. The outstation calculates 15 minute averages (or in the case of temperature takes a 15 min spot reading) and relays the data by a phone line to a central processing unit known as SCOPE. The SCOPE data is available to the Regional Control Centre and local PCs. The System serves as a single source of process data with automatically generated performance indicators that allow exception notification and strategic analysis. An important functionality of the System is Exception Reporting. This function compares the recently archived value with a limit value and generates an Exception Report if the value is out of range. The Exception Report, as an email, is sent to selected recipients. An Operational Database has been designed to hold asset dimensions and other site details (current operational units and trigger (limit) values) which are used in the calculations. A relationship has been established between the sum of the spot sample TSS + BOD and archived turbidity (see Figure 1). 80% of the ‘permitted’ turbidity is used in the outstation to generate an alarm in SCOPE if the 15 minute mean turbidity exceeds the ‘permitted’ turbidity for more than a chosen time span. This may be instantaneous or up to 2 hours depending on the environmental significance of the discharge. A high priority alarm is then issued to the site/standby Operator who will visit the site and take appropriate action. The Process Management System generates an Exception Report by email to selected recipients if the daily average turbidity held in the derived values archive exceeds 80% of the ‘permitted’ turbidity. Each Exception Report generated is investigated by the Process Scientist and an ‘Exception Reason’ is chosen from an agreed list of 43 operational and environmental causes of high turbidity – ranging from storm conditions and mechanical failure to equipment malfunction and vandalism. These reasons are then summarised and used for Business Intelligence purposes. In this way Southern Water is monitoring performance of all WWTPs against a continuously monitored parameter in addition to the compliance statistics generated by spot sampling. The installation of on-line monitors has encouraged a proactive response to system deterioration, which has resulted in a significant reduction in staff time associated with operational management of the wastewater assets. Non-routine site visits by Operational Staff have been reduced, and Wastewater Support Staff can target their site visits to WWTPs with poor performance as identified by on-line monitors. The plant performance data has been improved with the use of 35,040 readings at fifteen minute intervals per monitor per year. The consequences have been protection of compliance and the identification of optimisation opportunities. Routine final effluent sampling has been substantially reduced, resulting in considerable savings in sampling and analytical costs. Real-time access to turbidity data also helps troubleshooting. For example, high turbidity values can indicate filter rotation problems, hydraulic/organic overload, final tank scraper failure, secondary treatment bypass or tertiary treatment failure. In addition to the benefits from early warnings of poor quality effluent and the ability to show deteriorating trends, compliance levels have been maintained at around 98% since installation of the monitors began. A key United Utilities water treatment facility has significantly reduced the risk of failure to comply with the regulatory requirements of the Badenoch Bouchier report and reduced the number of maintenance hours spent by installation of a continuous in-line turbidity probe. As an additional benefit advanced warning of de-sludging issues can be immediately identified enabling the plant operations to rectify the situation in minimal time. United Utilities Group PLC forms the largest listed water business in Britain, controlling through its subsidiary United Utilities Water (UUW), the licence to provide water and wastewater services to 7 million customers in the North West region. Between the period 2010-2015, UUW is investing £300m improving treatment at 45 of their facilities promising the development of innovative operational solutions to optimise water treatment efficiency beyond the scope of existing processes. 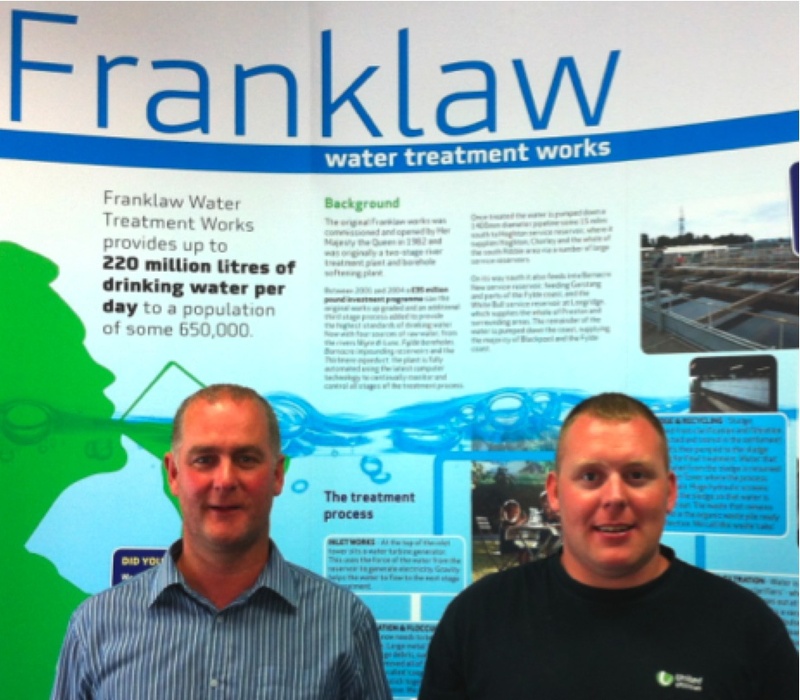 Franklaw WTW based just outside Preston is a key treatment plant in the North West catchment area drawing raw water from various sources including the rivers Wyre and Lune, Fylde borehole, Barnacre reservoir and Thirlmere aqueduct. As a key facility, the plant supplies treated water to a population of 650,000 within Blackpool, Preston and the surrounding districts, providing up to 220 million litres of water per day (equating to a staggering 93,000 glasses of water per second). The years 2001-2004 saw £35 million investment by United Utilities to upgrade and develop the washwater treatment processing at the plant providing lamella based clarifiers for efficient washwater treatment. North Lancashire Water Technical Officer James Bowsher (see photograph) explains the current treatment process at Franklaw WTW: “Treatment begins with water drawn from 4 inlet sources which are mixed and course-screened to remove large debris. The coloured raw water is dosed and mixed with Aluminium Sulphate and Polyelectrolyte. The coagulated waters then enter the upward flow super-pulsator units which hold the floc within baffle plates while the cleaner water flows upwards and on to the next processing stage. From here, clarified water enters one of 12 rapid gravity filters to trap any remaining particulates. Periodically these filters are automatically backwashed with air and then water to prevent blockage, and the backwash water passed to dirty backwash water tanks for blending and balancing. These waters then pass through a series of lamella clarifiers for further treatment. Continuous recycling of a small percentage of the total works throughput has dual benefits: 1. there is no need to discharge excess volumes to the water course – eliminating the imposition of discharge consent limits by the Environment Agency and 2. internal recycling reduces the water draw from local resources with river and water stocks sustainably preserved. Backwash water heavily loaded with sticky organic residues (which deposit over the lamella plates during settlement) must be carefully monitored to ensure that turbidity complies with the 10NTU limit imposed by the Badenoch and Bouchier reports. 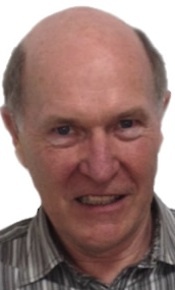 As James Bowsher continues “In the past we used off-line turbidity analysers with the sample pump fed from the supernatant holding tank post the 6 lamella clarifiers. This holding tank combines a strategic sampling point with an inbuilt overflow unit to carry excess volumes back to the lamella for recycling. With previous systems, water from the tank was pumped into a separately housed kiosk to the inlet of the turbidity analyser and this gave a delayed turbidity reading. Off-line instruments give good accuracy by enabling a controlled sample environment at optimum temperatures, with bubble traps to reduce interference from air pockets which can scatter the light path and cause false readings. However the nature of the process water in the lamella application was found to cause organic deposits to build up in the sample lines causing serious blockage in the joints and tubing of the flow path. As a result, turbidity readings were found to frequently flat-line. United Utilities challenged Hach Lange to provide a reliable plug and play, low maintenance in-situ system to avoid the issues arising with off-line systems. A self-cleaning Solitax sc turbidity probe was recommended, mounted on a sliding pole for simple probe removal and maintenance. Based on a dual infrared light scattering technique reliable, real-time monitoring in very low to highly turbid (up to 15% solids) and coloured water samples is afforded. With an automatic cleaning unit, drift free operation is assured despite continuous operation in the wastewater stream and with maintenance limited to an annual change of the wiper blade maintenance is almost entirely eliminated. The system is factory calibrated and requires just a simple factor against a single laboratory result before use eliminating the need for the commonplace dilution based calibration of contemporary systems. The Solitax sc probe was pole-mounted approximately 1m below the water surface in the combined holding tank of the backwash water (alongside the overflow pipe). The system operates such that if the turbidity approaches the user-set threshold a high range alarm is triggered to stop the supernatant pump returning back to the inlet and diverting the water back to the lamella for re-treatment. Should the water level drop below the height of the probe, an alarm is raised by localised level sensors and the subsequent rise in turbidity from exposure to excess light provides a secondary alarm of high turbidity providing a dual safety approach. Initial trial data was verified alongside a portable turbidity analyser and proved that when the lamella were overloaded, causing excessive valve head pressure (which increases the sludge retention and reduces the transfer of water) the set alarms promoted immediate intervention, saving many hours of maintenance and re-treatment costs. Site Manager Michael Tillery describes the immediate benefits of the system: “The in-line Solitax probe gives instant, accurate turbidity results and much quicker than we could achieve with pump fed off-line systems. The particular advantage in the sampling set up is that it is virtually maintenance free, with automatic self-cleaning of the optical surface every 12-24 hours eliminating the maintenance we previously faced to hose down and remove organic deposits. A precautious wiping frequency keeps the turbidity reading cycling below the target threshold which is much better than letting the value creep towards the consent limit. Thrilling results for nutrient monitors! Commenting on the results of a 4 month trial of nutrient monitors, Hach Lange’s John Moroney says he is “absolutely thrilled” with the report on his company’s instruments which outperformed the competition in almost every measure. The levels of nutrients, such as ammonium and phosphates, entering natural water resources is of great concern because these nutrients can either remove vital oxygen or lead to excessive plant growth and algal blooms, which harm wildlife through eutrophication. In addition, high levels of phosphate or nitrate in abstracted water significantly add to the cost of drinking water treatment. The management of nutrient levels is therefore dependent on the ability to monitor accurately and reliably, and as a result, a group of British water companies organised a joint monitoring trial to determine the best instruments. The trial involved the installation of turbidity, phosphate and ammonium monitors from the market’s leading manufacturers at two designated final effluent plants within Britain. Hach Lange provided an AMTAX sc ammonium analyser, a PHOSPHAX sc phosphate analyser and a SOLITAX sc turbidity analyser for the trial. 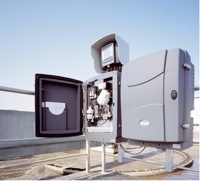 The SOLITAX sc performed better than any of its competitors and as a result, Severn Trent Water has adopted the instrument in a framework agreement. The whole life costs of the Amtax sc for Ammonium and Phosphax sc for orthophosphate have been drastically reduced as a result of the chemistries employed. With the Amtax sc, a gas sensing electrode is utilised which means that reagent consumption is halved in comparison with traditional colorimetric analysers. For the Phosphax sc, the stability of the vanado-molybdate method, means that calibration is not necessary and therefore no calibration standards are required. The results of this trial will be of great interest to process managers who have to comply with tighter discharge consents as a result of the Water Framework Directive. Couple this with the fact that Hach Lange can now offer sample preparation systems that deliver continuous samples from the inlet all the way through to final effluent, John Moroney firmly believes these analysers lead the way in reliability, accuracy, stability and the lowest whole-life costs. The SEA LIFE Centre next to the pier in Brighton (GB) is the world’s oldest operating aquarium. 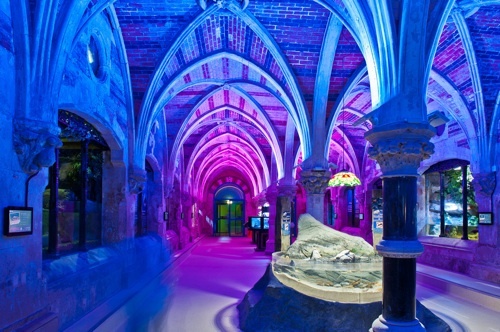 Originally designed by Eugenius Birch in 1872, the popular attraction has recently benefited from substantial renovation and now offers a range of new attractions including a Jellyfish Discovery & a Behind the Scenes tour. In order to protect water quality, each tank at the Brighton attraction has its own filtration system, including a pressurised sand filter, a biological filter and a carbon filter where appropriate. 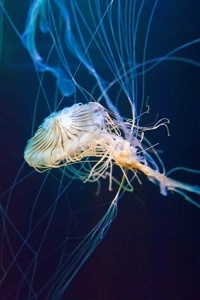 Some tanks, containing particularly sensitive species such as seahorses, octopus and jellyfish, also feature an ultraviolet treatment system. Reagents for the spectrophotometer tests are supplied in small pre-filled powder pillows containing extremely accurate amounts of reagents. This ensures that the tests are conducted in the same way every time and avoids potential errors whilst also saving time and chemical wastage. The spectrophotometer has an internal memory containing the calibration data for a large number of parameters so that Carey and her colleagues simply choose the pillow reagents for the tests they need. The test procedure is very simple; the contents of a powered pillow are simply added to a small sample and a coloured solution is allowed to develop for a specific time. The sample tube is then inserted into the spectrophotometer which provides a highly accurate and repeatable reading. The water quality monitoring equipment is also used in research conducted in collaboration with Sussex University. Much of this work is with Cephalopods such as cuttle fish and addresses a range of issues including feeding behaviour, camouflage and nutrition. Accurate water quality monitoring is necessary in all of this work to ensure that observed effects are not the result of water quality changes. Visitors to the aquarium can view research work during the ‘Behind the Scenes’ tour, in addition to the nursery area, the laboratory and the food preparation section. Anaerobic Digestion (AD) relies on the ability of specific micro-organisms to convert organic material into a gas that can be used to generate electricity. However, these bacteria require specific conditions if they are to function effectively and instrumentation specialist company Hach Lange has developed a range of online, portable and laboratory instruments that have enabled a large number of AD plants to maximise efficiency and prevent the risk of failure. In 2009, renewable energy accounted for just 3% of Great Britain’s energy supply. However, the Government there has a target to raise this contribution to 15% by 2020 as part of its strategy to fight climate change. Along with wind, solar and various other sources of renewable energy, AD has an important role to perform in helping to achieve the renewable energy target whilst also helping with the management of organic waste. Biogas is generated in large anaerobic digesters; air tight tanks in which bacterial digestion takes place in the absence of oxygen. Biogas is a combination of Methane, Carbon Dioxide and many other gases in trace amounts, which can be burnt to produce electricity, and then transported to the National Grid. Alternatively it can be further processed and refined to around 100% methane and injected into the national gas grid. The remnant digestate can be used for a variety of purposes such as a nutritional additive to crops on arable land, much in the way manure is used, or as a landfill restoration material. There are two types of biogas plants, determined by the substrate they use; co-fermentation plants and renewable raw material fermentation plants. In co-fermentation plants, substrates of non-renewable raw materials are used, such as residues from fat separators, food residues, flotation oil, industrial waste products (glycerol or oil sludge) and domestic organic waste. Renewable raw material fermentation plants utilise materials such as maize, grass, complete cereal plants and grains, sometimes together with manure slurry. Efficiency is vital to the success of a biogas production plant; bacteria require optimum conditions to effectively produce biogas from the digestion of organic matter. Plant operators therefore have a strong interest in the efficiency of their biogas plant and the activity of the bacteria. Consequently these production plants require reliable, on-site analysis in combination with continuously operating process instruments. Loading excessive levels of biomass into a digester may have severe economic consequences and could potentially lead to biomass inactivation and necessitate a cost-intensive restart. Conversely, under-loading a biomass digester could also have financial implications, because less electricity is produced and potential revenue is lost. Substrate amounts must be tailored to achieve the optimum rate of bacterial digestion. The degradation process which occurs within the biogas plant digesters does so in a highly sensitive microbial environment. The digesting, methane-producing bacteria, for example, are highly temperature sensitive and most active within the temperature ranges of around 35 to 40 DegC and between 54 to approximately 57 DegC. The specific nature of the microbial environment inside the digesters must be maintained throughout fermentation to increase production and avoid inactivation of the highly responsive bacteria. 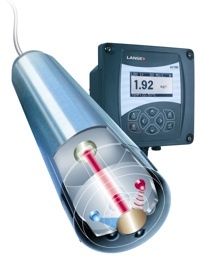 Hach Lange provides portable, laboratory and online monitoring systems that facilitate examination at key points within the fermentation process, including eluate analysis, where the substrate is fed into the digester, but also within the digester itself. Online process analysis instrumentation can be employed to continuously maintain optimum conditions within the biogas plant and/or samples can be collected regularly for analysis. Different analytical instruments are required for different stages of the fermentation process: at the substrate entry point; within the main digester; in post-fermentation tanks and to continuously monitor biogas production. Process monitoring instruments used across the fermentation cycle allow operators to constantly supervise the anaerobic digestion rate and biogas production. One of the most important measurements for assessing fermentation progress is known as the FOS/TAC ratio. This is determined by their TIM 840 Titrator, and the values generated enable the system supervisor to identify potential process problems such as the imminent inversion of digester biology, so that countermeasures can be initiated. The FOS stands for Flüchtige Organische Säuren, i.e. volatile organic acids while TAC stands for Totales Anorganisches Carbonat, i.e. total inorganic carbonate (alkaline buffer capacity). To measure the FOS/TAC ratio with the TIM 840 titrator, 5ml of sample is added to a titration beaker containing a follower bar. 50ml of distilled water is then added and the measurement is started. 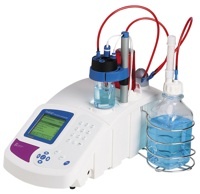 The addition of reagents is then conducted automatically by the titrator which saves operator time and reduces the potential for human error. After about 5 minutes the TAC and FOS values are calculated automatically using a pre-programmed formula. All measured values can be stored in the autotitrator and/or sent to a printer or PC. The FOS/TAC ratio provides an indication of the acidification of the fermenter, which is an important measurement because a low acid content demonstrates that the rate of bacterial digestion is not high enough. Conversely, too high an acid content means bacterial digestion is exceeding required levels, due to an overloading of substrate. At the Resource Recovery facilities which incorporate AD plants the feedstock is derived from domestic waste collections – the ‘black bag’ portion that would otherwise be destined for landfill. Pre-sorting removes plastics, metals and glass, after which the waste is pulverised to produce a slurry that is passed to the AD plant. This slurry contains the organic fraction that is processed to produce biogas. Steve’s team uses Hach Lange instruments to closely monitor the entire process and to ensure that the plant’s bacteria are provided with optimal conditions. These tests include chloride, pH, alkalinity and volatile fatty acids; the ratio of the latter two being the same as the FOS/TAC ratio, which is determined by a TIM Biogas titrator. In addition, samples are taken from the feed, the digesters and the effluent to monitor ammonia and COD with a Hach Lange spectrophotometer. This data is essential to ensure compliance with the plant’s discharge consent. The Reliance Street plant utilises biogas to generate electricity and the residue from the AD process can be defined as a product rather than a waste because it complies with the BSI PAS110 Quality Protocol for Anaerobic Digestate (partly as a result of the monitoring that is undertaken). This product is termed ‘compost-like output’ (CLO) and can be landfilled, used as a landfill cover, or spread on previously developed land to improve that land. However, CLO cannot currently be applied to agricultural land used for growing food or fodder crops. The Hach Lange test and monitoring equipment enables the operators of AD plants to ensure that the bacteria are provided with optimum conditions so that biogas production is as efficient as possible. As a result, less waste is sent for landfill and renewable energy is generated efficiently. This ensures the best possible return on investment and by reducing the use of fossil fuels for power generation, helps in the fight against climate change. Why monitoring plays such an important role at a manufacturing business in the North East of England. Reliable 24/7 monitoring and control of a pharmaceutical company’s wastewater facility is fundamentally important to the successful operation of the entire business. This is because failures or down-time in the wastewater treatment process would quickly result in waste stream back up. It follows therefore that monitoring equipment should be extremely reliable and this is why Shasun Pharma Solutions employs Hach Lange monitoring equipment at many locations around their manufacturing facility just north of Newcastle upon Tyne (GB). Shasun Pharma Solutions provides research and contract manufacture services to the pharmaceutical industry, including small scale manufacture for clinical trials and full scale commercial manufacture of advanced intermediates and active pharmaceutical ingredients. With both large and small customers spread across Europe, North America, Latin America and Asia, the business has to be able to demonstrate a high level of environmental management. The liquid oxygen is stored onsite and provides Craig with almost instantaneous control of dissolved oxygen in the plant. 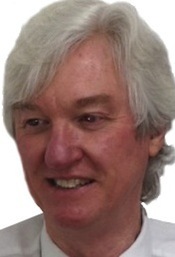 He says: “This is made possible as a result of the new breed of dissolved oxygen sensors that we use – the ‘LDO’. The liquid oxygen is vapourised and fed into the tanks via a single entry point Venturi at around 7bar and the objective is to maintain DO at 3mg/l +/- 0.2. In addition to online sensors for pH and ammonium, the LDO sensors are connected to an SC1000 controller which also monitors the ‘health’ of the sensors and interfaces with the plant’s control systems. Shasun’s wastewater treatment facility effectively removes 95% of COD (Chemical Oxygen Demand) which is a common method for the determination of organic pollution. COD testing is therefore conducted onsite and Craig’s team employ a Hach Lange spectrophotometer for this purpose. The pre-filled, bar-coded Hach Lange COD tubes ensure that every test is conducted in exactly the same way, with exactly the same reagents. Bar-coding ensures that the spectrophotometer recognises each sample and ensures traceability of results. Craig’s team conducts between 30 and 100 COD tests every week and this data helps in the efficient running of the plant and helps ensure compliance with the discharge consent. It also provides Craig with useful information for the calculation of waste treatment charges for third parties. “This is because 1 tonne of COD requires approximately one tonne of liquid oxygen for treatment,” he explains.